n this post I’d like to introduce the Bōzooka. It is a training tool I discovered and learned on Okinawa. But first a few words on quality material for wooden weapons and equipment. The photo on the right shows what you get from bad quality weapons. A few strikes with this “bo”, which has 3cm of diameter, against the beech tree, and see what this wood is made of inside. It is dry, unflexible, and has short fibers. It’s good for nothing. It has no inner substance, just outer form. It’s dangerous for yourself, and to others. And it’s sold by a martial arts equipment provider. 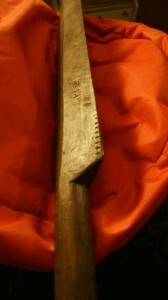 An ueku (oar) I broke on Okinawa, by a strike known as Gyaku-uchi. It flew through the whole dojo. Not good. Dangerous to yourself, but that’s ok. Dangerous to others: not ok! Only use quality woods! The subtropical marine climate of Okinawa, with an annual average temperature of 22 ° C and regularly hit by typhoons, brings about particular characteristics of trees. Okinawan trees must withstand many years of wind, weather, salt water, sun, dryness and moisture. Quality wood selected for the manufacture of bō can partly be attributed to this. The selection of quality wood should receive adequate attention. As construction timbers in Okinawa are mainly used binrō (betel nut palm; Areca catechu), akagashi (evergreen oak; Quercus acuta), inumaki (large-leafed stone-yew tree, also called kusamaki; Podocarpus macrophylla), iju (Colloquially called nju; a sort of camellia; Camellia sasanqua or Schima wallichii ssp. liukiuensis), matebashī (a sort of beechwood; Lithocarpus edulis), fukugi (mangosteen tree; Garcinia subelliptica), īku (also called mokkoku; Ternstroemia gymnanthera), urajiro-gashi (oak tree, Quercus miyagii Koidz.) and others. The binrō stem is widely used throughout Southeast Asia as a construction material in a variety of purposes. The wood is also used for producing utility articles such as rulers or shelves. Furthermore, wooden nails made from its stem are widely used in the furniture industry. Binrō is particularly well adapted for producing bujutsu-style bō. Its crucial characteristic is that it has both extraordinary muchimi (i.e. elasticity) and stiffness. It is usually colored black, giving it a shiny and smooth surface. black lacquer of the Binrō-bō. 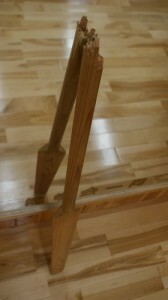 Binrō is a robust wood. When used in kumibō it can be observed that its surface does not crack open from impact, but rather deforms and compresses, making the surface even harder. As a result of this and the black lacquer, splinters are not a serious concern when sliding the bō in the hands. Even if it breaks during the exchange of thrusts and blows, the breaking area will mostly be sharp and pointed similar to a spear tip. Thus it still has utility value as a spear or pike (hoko). This is due to the long fibres that strenghten the long and rather thin single-stemmed trunk of 10-30m height at only 20-35cm diameter. Nature as an engineer. If you ever come across someone who also ever owned a Binrō-bō, pease say hello from me. Surface of binrō-bō compressed by impact. Nowadays binrō as an industrial wood is rare. As it is considered a high quality material, it is difficult to obtain. However, on the islands south, north and east of Okinawa this plant grows in masses. The long fibres provide a lot of muchimi (strength while flexible) to the Binrō-bō. 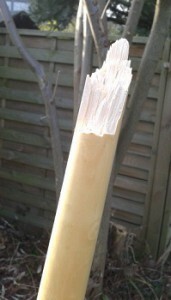 The length of the breakage is about 25cm, sharp at the adges, and pointed on top. At least 50 years old, this ueku (oar) is heavy duty. I used it to test the Bōzooka. Successfully. There is an interesting tradition among the maritime people of Okinawa: When a son was born into a fishermen family, an Īku tree was planted (also called mokkoku; Ternstroemia gymnanthera). Once he reached a marriageable age, an oar (uēku) was made from the tree. The uēku was not only an important marine equipment, but was also considered the soul of the fishermen. When I once bought a heavy old uēku from a friend in Okinawa, he and a present guest explained that the uēku was produced from the heartwood of the trunk. 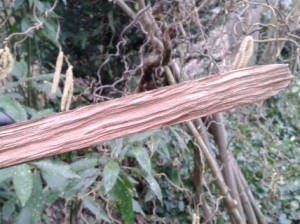 However, there is a knothole of about 2cm diameter in it, so the tree must have been either quite thin, or it was actually cut from an outer part of the stem. Whether the heartwood or the sapwood of a tree trunk is best suited largely depends on the kind of tree. In addition, in a large trunk the heartwood might be superior in hardness, strength, and toughness as compared to the sapwood. In a smaller tree, however, this ratio might be reverse. I brought this idea from a dōjō in Okinawa. It was the only place I saw it and wasn’t part of the curriculum; rather, it was a tool used by the late sensei of the sensei. 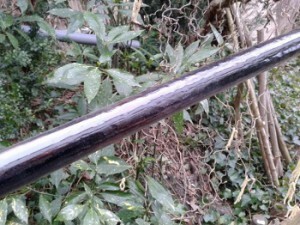 It was basically a thin bamboo stick of about 0.8 cm diameter, maybe 80-100cm long. Sensei explained and showed me how it works. He even took it home, where he would use it in the living room, fastening it to the timberwork. Mine is much bigger. In order to make it useful for both empty hands and weapons, I revised the original design. And as I used an old binrō-bō I once got in Okinawa, so I named it the Bōzooka. The binrō-bō once broke during kumi-bō with my friend and colleague Ralf Budde some years ago. But I kept it and made the Bōzooka from it. Though broken, it’is still about 150cm long, 3cm in diameter and made from the stem of the betel nut palm. Needless to say, any other staff can be used for its construction. The Bōzooka trains reflexes. As a short and superficial explanation (once and for all): we use mechano-receptors and pain-receptors in our skin. They tell us everything about pressure, touch, vibration and pain. This is called surface sensitivity or haptic perception. There is also a passive perception of mechanical impressions, which is tactile perception. Haptic perception is composed of protopathic sensitivity and of epicritic sensitivity. The protopathic sensitivity is responsible for pain perception. As such it is hardwired to PROTECT THE BODY and therefore is a FAST REACTING system. However, in the spatial sense it is undifferentiated. That’s where the epicritic sensitivity comes in, or the ability to perceive spatially closely adjacent tactile stimuli as separate stimuli. This provides us with a “third eye” of what’s going on. The Bōzooka is basically a rather heavy bō. 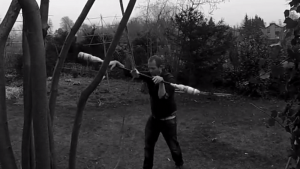 When training it may spin fast and hit you like a strike. It is the same as being hit by any wooden club. So you may want to take it easy, because – as you know – they harder you come, the harder Bōzooka gets. That’s why I placed pads on each end. I am working with a master joiner for all my weapons and tools, like with my Tonfa design, which achieved the praise of not only Okinawan masters. It’s the little things. Anyway, the Bōzooka will be available soon. The following video was filmed March 19, 2015. First some empty hand is shown, followed by bō (standard kumi-bō; 182cm/3cm), and finally heavy duty uēku, which is a more than 50 years old treasure I brought home from Okinawa. Of course. Okinawa master weapons craftsman Kami Unten in his workshop with Bo, Nunchaku, Tonfa etc. on the wall. 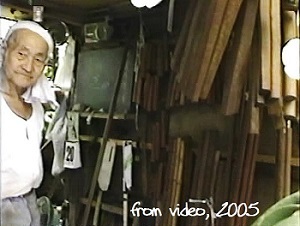 In the back of his workshop he grew orchids in dozens. Photo taken from a video courtesy of Katherine Loukopolo. And here’s some Tunfa work on my “Bozooka”. To be honest, it’s the best practice partner I’ve ever had, not only because it doesn’t talk. The Tunfa used are a unique design I adapted from a pair made by Okinawan master weapons builder Kami Unten. Haven’t heard of him? Ask Okinawan Sensei. The Tunfa has three distinct features that make them work so good you will never ever touch again cheap massware Tunfa. These are made of Bubinga, an excellent and heavy hardwood. They literally roll by themselves and develop a momentum that even a seemingly casual swings generate terrific destruction power. No need making a portent face here. This entry was posted in Book Reviews, Misc, Unknown Ryukyu and tagged akagashi, Areca catechu, bad quality weapons, betel nut palm, binro, Bōzooka, evergreen oak, fibers, Kami Unten, muchimi, quality wood, ueku. Bookmark the permalink.